The runcommand is the script responsible to launch your emulators/games. This wiki shows the runcommand's configurations and features. Each time you load a ROM there is an option to open what is called the Runcommand Launch Menu. This is accessed by pressing any key on the keyboard or button 0 on a joystick (what is the button 0 vary depending on the gamepad used). There are also varying options to change video settings, RetroArch configs for that system, etc. In the past there were multiple rom folders for each emulator but they got confusing so now there is only one rom folder for each system and the emulator used can be loaded dynamically so there is no longer a need for multiple rom folders for each system. You can enable and disable different functions of the Runcommand Launch Menu. This is configured via RetroPie-Setup or via the runcommand configuration option in the RetroPie area of Emulation Station. Launch Menu Art: If enabled, any scraped box art you have for a game will show up as a splashscreen while your game loads up. Launch Menu Joystick Control: You can disable the joystick support so that your kids don't accidentally mess up settings. Note that this only disables the joystick, not the keyboard so if you have joysticks that act like a keyboard then of course disabling this option will not work. Launch image delay in seconds: Set how many seconds the launching image will be displayed before start the game. Runcommand can show a custom "launching" image instead of the traditional dialog infobox. The images must be placed at /opt/retropie/configs/SYSTEM_NAME/ and named as launching.png (or .jpg). But be aware that if "Launch Menu Art" is enabled, the scraped box art image takes precedence. Example: if you have a cool NES related image and want to show it right before launching a NES game, you have to name the image file as /opt/retropie/configs/nes/launching.jpg. A more general launching image (not related to a specific system) can be named as /opt/retropie/configs/all/launching.jpg. "Manage packages" >> "Manage experimental packages" >> "launchingimages" >> "Install from binary"
After installing you can use the tool going to RetroPie-Setup main menu and choose Configuration / tools >> launchingimages and then follow the instructions on screen. Here is a nice video tutorial about this tool. The launching images can also be used in a per game basis. The image must be placed at $HOME/RetroPie/roms/SYSTEM_NAME/images/ and named as RomName-launching.png (or .jpg), where RomName must be the exact name of the ROM minus the trailing extension. Example: if you have a launching image for the "Mega Man" NES game and the ROM is named Mega Man (USA).nes, you have to name the image file as RetroPie/roms/nes/images/Mega Man (USA)-launching.png. Once these images are installed, the timing to activate the runcommand menu differs, in that pressing a button will not register successfully until just after the image has disappeared. Runcommand can execute an user script before the game launching (runcommand-onstart.sh) and after exiting the emulator (runcommand-onend.sh). Both scripts must be placed at /opt/retropie/configs/all/. In the Take and Scrape Your Own Screenshots wiki there are two methods to achieve the same goal. In method 1 the runcommand-onstart.sh is used to automatically set some configurations in the system specific retroarch.cfg file. 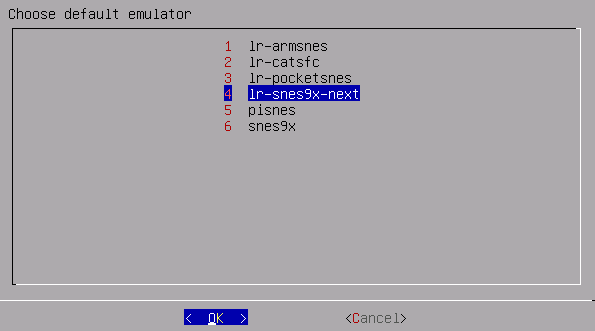 In method 2 the runcommand-onend.sh is used to check if you have a screenshot for the game you are leaving, and if yes, it will make the most recent screenshot be the emulationstation image for this game. In RetroPie-joystick-selection tool the joystick selection by name method uses the runcommand-onstart.sh to get the joystick name, look for its index and set the index in the proper retroarch.cfg file. Since version 4.2.8 runcommand menu creates an option named User Menu where is possible to choose a custom script to launch. The custom scripts must be placed at /opt/retropie/configs/all/runcommand-menu and file name must end with .sh. Useful data are passed as arguments to the custom scripts in the same way they are passed for runcommand-onstart/onend scripts. exit status 0, returns to user menu (script list). exit status 1, exits runcommand without launching the game. exit status 2, launch the game. any other exit status, returns to user menu (script list).